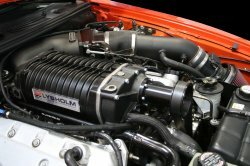 Lysholm 2003-2004 Terminator Cobra 3.3L Twin Screw Tuner Kit  : Supercharger Superstore, Your Online Source for Vortech Superchargers, Paxton Superchargers, Procharger Superchargers, Magnacharger Superchargers and Techco Superchargers! Features the Lysholm 3300 twin-screw supercharger, capable of 800+HP at 25+PSI Boost. Designed for use with the 4.6L 4V engine in the ‘03-‘04 Mustang Cobra. Fits under the stock hood, but under-hood blanket must be trimmed or removed. OEM engine, including crank pulley and rev-limit. Extruded aluminum high-flow fuel rails with mounting hardware. -6 ORB ports. Provisions for EGR mount. Includes EGR valve relocation hose. Alternate supercharger drive pulley size available separately: 2L038-375-01 (3.75”). More sizes to come in the future. Replacement belt: 2A048-765 (Dayco 5080765). Compatible with 4.00” and 3.75” pulley sizes. Throttle body requires OEM TPS sensor (removed from OEM throttle). Battery relocation is required (optional Vortech #8N150-010 is a complete relocation assembly that includes 1Ø cable and ends, NHRA legal aluminum box and hardware). Battery relocation components are not included in this tuner kit. Not smog legal. Off-road use only.